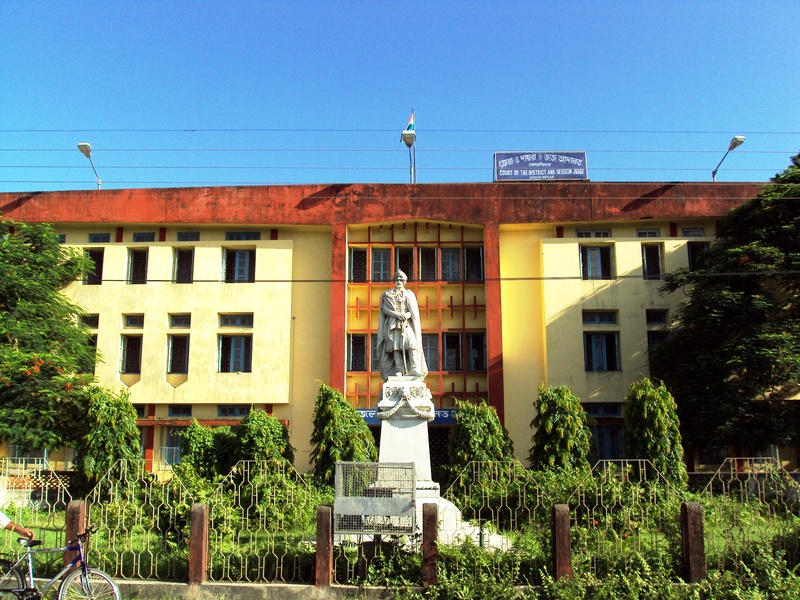 Cooch Behar (Bengali: কোচবিহার, Kochbihar ) is the district headquarters and the largest city of Cooch Behar District in the Indian state of West Bengal. It is situated in the foothills of the Eastern Himalayas and located at 26°22′N 89°29′E. Cooch Behar is the only planned town in North Bengal region with remnants of royal heritage.One of the main tourist destinations in West Bengal, the town is well known for the Cooch Behar Palace and Madan Mohan Bari temple and has been declared a heritage town. The princely state known during British rule as Cooch Behar had been part of the Kamarupa Kingdom from the 4th century to the 12th century. In the 12th century, the area became a part of the Kamata Kingdom, first ruled by the Khen dynasty from their capital at Kamatapur. The Khens were an indigenous tribe, and they ruled till about 1498 CE, when they fell to Alauddin Hussain Shah, the independent Pathan Sultan of Gour. The new invaders fought with the local Bhuyan chieftains and the Ahom king Suhungmung and lost control of the region. During this time, the Koch tribe became very powerful and proclaimed itself Kamateshwar (Lord of Kamata) and established the Koch dynasty. The first important Koch ruler was Biswa Singha, who came to power in 1510 or 1530 CE. Under his son, Nara Narayan, the Kamata Kingdom reached its zenith. Nara Narayan's younger brother, Shukladhwaj (Chilarai), was a noted military general who undertook expeditions to expand the kingdom, and he became governor of its eastern portion. After Chilarai's death, his son Raghudev became governor of this eastern portion. Since Nara Narayan did not have a son, Raghudev was seen as the heir apparent. However, a late child of Nara Narayan removed Raghudev's claim to the throne. To placate him, Nara Narayan had to anoint Raghudev as a vassal chief of the portion of the kingdom east of the Sankosh river. This area came to be known as Koch Hajo. After the death of Nara Narayan in 1584, Raghudev declared independence, and the kingdom ruled by the son of Nara Narayan, Lakshmi Narayan, came to be known as Cooch Behar. The division of the Kamata Kingdom into Koch Behar and Koch Hajo was permanent. Koch Behar aligned itself with the Mughal Empire and finally joined the India as a part of the West Bengal, whereas remnants of the Koch Hajo rulers aligned themselves with the Ahom kingdom and the region became a part of Assam. The early capital of Koch Kingdom (Cooch Behar) was not static and became stable only when shifted to Cooch Behar town. Maharaja Rup Narayan, on the advice of an unknown saint, transferred the capital from Attharokotha to Guriahati (now called Cooch Behar town) on the banks of the Torsa river between 1693 and 1714. After this, the capital was always in or near its present location. In 1661 CE, Maharaja Pran Narayan planned to expand his kingdom. However, Mir Jumla, the Subedar of Bengal under the Mughal emperor Aurangazeb, attacked Cooch Behar and conquered the territory, meeting almost no resistance. The town of Cooch Behar was subsequently named Alamgirnagar. However, Maharaja Pran Narayan regained his kingdom within a few days. During 1772–1773, the king of Bhutan attacked and captured Cooch Behar. To expel the Bhutanese, the kingdom of Cooch Behar signed a treaty with the British East India Company on 5 April 1773, and the king of Cooch Behar became a feudal ruler under the British. The Victor Jubilee Palace was based on Buckingham Palace and built in 1887, during the reign of Maharaja Nripendra Narayan. In 1878, the Maharaja married the daughter of Brahmo preacher Keshab Chandra Sen, and this union led to a renaissance in Cooch Behar state. Maharaja Nripendra Narayan is known as the architect of modern Cooch Behar town.Whose famous marble statue has been embellishing beautifully to the north of the Sagar Dighi infront of present District Judges Court Complex,Cooch Behar. Under an agreement between the kings of Cooch Behar and the Indian Government at the end of British rule, Maharaja Jagaddipendra Narayan transferred full authority, jurisdiction and power of the state to the Dominion Government of India, effective 12 September 1949. Cooch Behar District became part of the state of West Bengal on 19 January 1950, with Cooch Behar town as its headquarters. Result for Group -D under Employment Notice No. 985 (Recruitment)/E,Dated, 26-06-2015.